ShepardFairey, an icon of the American contemporary art scene, is most famous for his Obey Giant artworks and subsequent Obey series, which have found their place on t-shirts, skateboards, posters, walls, and even clothes, spreading the name of the artist throughout the USA and world, eventually. His pieces are thought-provoking and often controversial. He’s also known for the Obama-regarding posters. Fairey remains one of the most famous artists in the world, whose work has inspired generations. 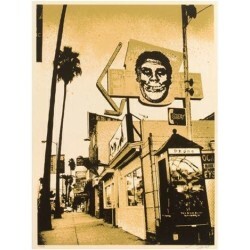 Obey - Shepard Fairey There is 1 product.